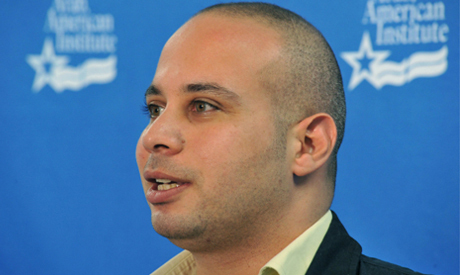 A founding member and former leader of the 6 April Youth Group, Ahmed Maher, called on those who had left the youth movement to rejoin following its first internal election. On 21 October, in the first elections since its launch in 2008, members chose Amr Ali to be the new leader. Ali, a co-founder and member of the organisational committee, was elected with 56 percent of the votes. He is succeeding Maher, who has been the leader of the group since its establishment. In the last two years, several members have resigned from the renowned group to protest over the absence of an internal process to elect the group’s head. Former members created the 6 April Democratic Front shortly after the 2011 popular uprising that toppled Hosni Mubarak. The youth movement was founded in 2008 by several pro-democracy activists to support workers of the industrial city of Mahalla, who were planning to strike on 6 April. Immediately after its creation, the group became one of Egypt’s leading pro-democracy movements and played an important role in the 2011 revolution. Head of the April 6 Democratic Front Mostafa El-Hagry told Al-Ahram Arabic website he had some reservations concerning Maher’s call. “When we organised internal elections within the 6 April Democratic Front, they took place under judicial supervision and were open to media coverage to ensure transparency, the opposite of what happened in the entity administrated by Maher,” El-Hagry told Al-Ahram.